Experience the best of US history with a modern twist on this small-group tour of Philadelphia. See where the Founding Fathers signed the Declaration of Independence, take a photo of the Liberty Bell, visit where past presidents like George Washington lived, and learn about William Penn, Pennsylvania's founder. You’ll discover the lively neighborhood culture of Old City as you pass art galleries and cafes, and top off your outing with a refreshing beverage at a local establishment. Numbers are limited to 12 for a personalized experience with an informative guide. Start your 2-hour tour at the Philly Tour Hub, where you can view local art and photography inside the historic building. Outside, get a glimpse of the Betsy Ross House and hear stories from your guide about the birth of the American flag. From here, weave through the charming back alleys of Old City and walk down Elfreth's Alley, one of the country’s oldest continuously occupied residential streets. In this vibrant neighborhood, you’ll pass trendy cafes, shops, art galleries and buildings featuring industrial architecture. When you reach Christ Church, where the Founding Fathers once worshiped, head inside (if it is open and available) to learn about the birth of the Episcopal Church in America. Then stop at a local coffee shop, where you may grab a quick snack or beverage (own expense) and relax with your guide — it’s the perfect opportunity to ask any questions you have about Philadelphia history. 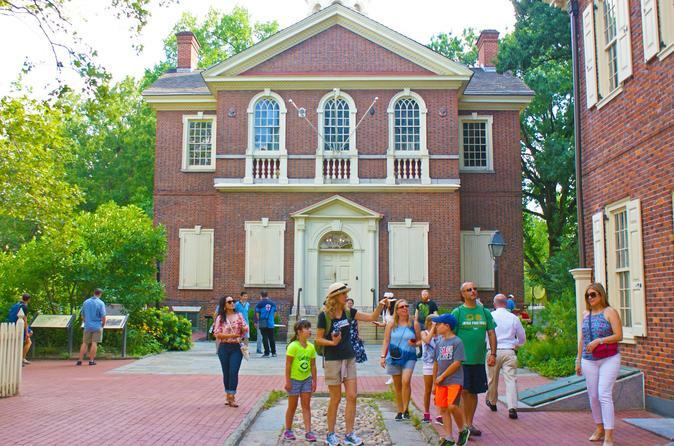 As your small-group tour continues through the Historic District, pass Franklin Court — the site of Ben Franklin's home — and view Independence Mall, the National Constitution Center and the US Mint. Follow your guide across the Mall and visit the President's House, once the home of George Washington and John Adams during Philadelphia’s tenure as the nation's capital. Then, it’s off to Washington Square for stories of William Penn, the state’s founder, and a possible visit to the Tomb of the Unknown Soldier. Stroll Independence Mall - the three block section of Independence National Park and the must-see Independence Hall (tour does not enter Independence Hall), where the Declaration of Independence and the US Constitution were signed. As you walk, learn about Congress Hall, Old City Hall, the Philosophical Society, the Second Bank of the US and Carpenter's Hall. Making your way back to the Old City neighborhood, end the tour at a local establishment. Enjoy a craft beer or refreshing non-alcoholic beverage before saying farewell to your guide or upgrade your tour and join us for a historical beer tour to learn about how beer and various pubs played a role in shaping our nation's history.